Tag line: "Starving for a great movie?" Trivia: First feature release from Mel Brooks' then new production company "Brooksfilms"
3 – It was one of the few times that perennial supporting player Dom DeLuise played the lead in a motion picture. That third point is, for me, the best thing about this 1980 comedy / drama. Regardless of whether he was playing second fiddle to Burt Reynolds (The Cannonball Run) or Mel Brooks (The Twelve Chairs, Silent Movie), Dom DeLuise was always a funny guy. In Fatso he got a chance to try his hand at drama as well as a little romance, and proved he could handle both just fine. 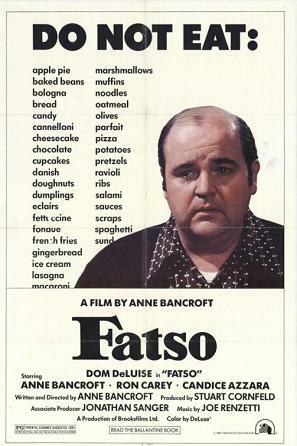 When their beloved, yet morbidly obese, cousin Sal drops dead at age 39, Antionette (Bancroft) orders her brother Dom (DeLuise), who is also overweight, to see a doctor and follow a prescribed diet. The problem is, Dom loves to eat, and has ever since he was a kid. Still, to make his sister happy, he promises to obey the doctor, and with the help of his younger brother Junior (Ron Carey), Dom sticks to his new diet. It seems that, no matter how hard he tries, Dom just can’t lose weight. Then Dom meets Lydia (Candice Azzara), a pretty blonde who recently opened a gift shop a few blocks away. Dom eventually falls for Lydia, and when the two of them are together, he’s never hungry. But will he ever be as thin as his siblings hope, or is Dom content to live out his days with Lydia as a jolly fat man? As you’d expect from a movie directed by Anne Bancroft, Fatso features a number of actors who worked regularly with her husband, Mel Brooks; aside from Bancroft and DeLuise, it co-stars Ron Carey (High Anxiety, History of the World Part 1) as Dom’s younger brother, as well as Sal Viscuso (Spaceballs), and Brooks’ writing partner Rudy De Luca (who co-wrote High Anxiety, Life Stinks and Dracula: Dead and Loving It) as two of their cousins. With a cast like this, there’s no doubt that Fatso is a funny film, and there are moments that definitely made me laugh (DeLuise shedding tears as the nurse rattled off a list of foods he’d have to avoid while on his diet is a comedic high-point, as is the scene in which a desperate Dom chases Junior around the apartment with a knife, threatening to kill him if he doesn’t turn over the key to the cupboard). Along with the humor, Fatso is occasionally romantic, with both DeLuise and Azzara doing a fine job as the socially awkward misfits who fall head-over-heels in love with one another. As a drama, though, the movie is less successful; we know why Dom eats (during the opening credits we see that, whenever a young Dom was upset, his mother would stuff food into his mouth to make him happy again), but the film never fully explores the issues that cause certain people to over-eat. Despite a few rough edges (the pacing suffers occasionally, a direct result of some scenes running on a bit too long), Fatso kept me entertained, and the fact that Dom DeLuise is the featured star is reason enough to see it. I recall seeing that film first-run in my hometown. I recall going in thinking it was a comedy, being surprised when it was a drama, and then not being able to stop comparing it to MARTY.